**LIMITED TIME PRICE and FREE SHIPPING for Amazon Prime - priced like a single, yet double in size. Unwind by yourself, invite friends, or include your dog! **SETS UP IN SECONDS Comfortable for you or add a friend; double sized strong parachute nylon, triple-stitched seams, and 3" solid steel carabiners; holds at least 400 lbs. 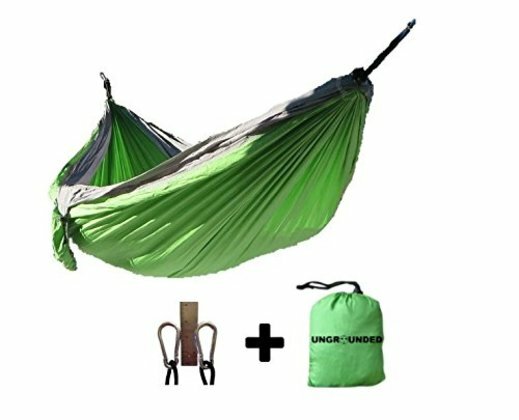 **SMALL AS A BAG OF MARSHMALLOWS - take on hikes, picnics, motorcycle rides, road trips, backpacking or beaches and outdoor concerts. Use in your backyard or on campus for social time. Attach to boat or RV. Can be used as a seat or even an extra bed. Take it anywhere! **BREATHABLE AND STRONG! - ultralight, portable, durable; washable and dries quickly. BONUS: Integrated stuff sack keeps keys and phone close. **NO-HASSLE WARRANTY: We prefer happy customers, replacement sent FREE of charge or money-back if it isn't quite what you want. No questions asked. It's no risk -BUY NOW!